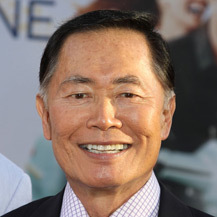 Hosato "George" Takei is an American actor, director, author, and activist. Takei is most widely known for his role as Hikaru Sulu, helmsman of the USS Enterprise in the television series Star Trek. He is a proponent of LGBT rights and active in state and local politics apart from his continued acting career. He has won several awards and accolades in his work on human rights and Japanese-American relations, including his work with the Japanese American National Museum.